Summer camp has been a bounty of fresh produce with our new farm tub garden producing piles of bok-choy, kale, spinach, Swiss chard, radishes, and just recently beans and heirloom dwarf grey sugar peas. The children have loved harvesting their own snack, and mornings often start in the garden with children choosing which leaves they want for snack. At snack time, we look over all of the various leaves available and compare the size, shapes and colors. Children then call out which ones they would like to try, and whether or not they would like dressing on them. The radishes were a little spicy for most children. We decided to make a pickling mixture to pickle the radishes, which was more to their liking and they were eaten the next day. The bok-choy stems were a little too stringy, so the children cut off the roots, took off the leaves, and we are now pickling the stems as well. 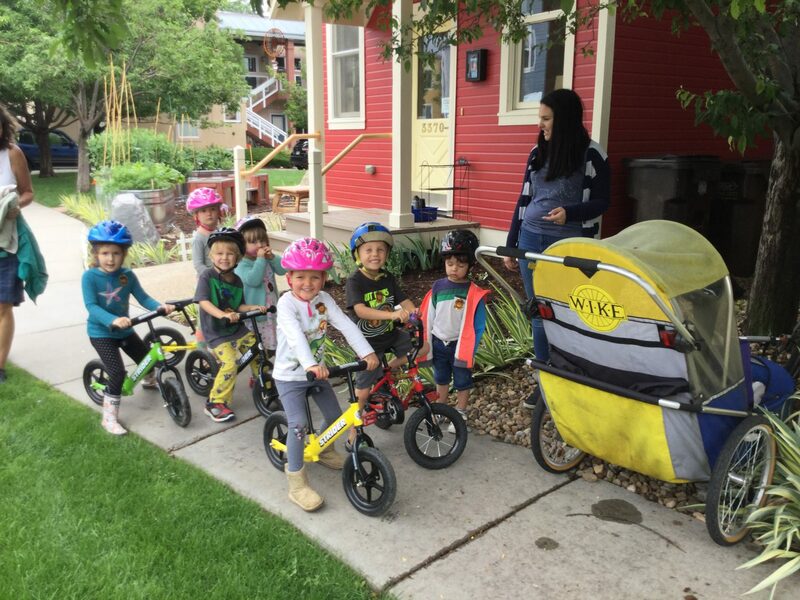 Children rode their Striders down to our Community Garden to see the produce growing there. They saw peppers, squash blossoms, cilantro, peas, assorted greens, and tomato plants. We harvested Mesclun greens, Boston Butter lettuce, and cilantro, which the children bought back, washed and bagged up for their families.